One of the most compelling considerations for a prospective pond owner is the matter of safety in and around the pond. This is especially true for those who have small children, or who are at all unsure on their feet, or who are accident prone. Having a pond in the yard can be a real treat, but the novelty can wear off pretty fast with the first drowning. We should all seek to avoid such unfortunate events, and with the recent proliferation of the number and types of water features in the world, safety should be even more important than ever as a consideration for those in the equipment manufacturing industry, and is for those of us who work in other people's ponds much of the time. 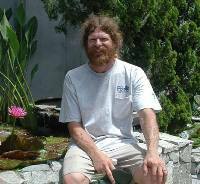 Having been in the pond industry for about 30 years, I have seen a great many ponds and water gardens in the southern part of my state, California. I am frequently asked by pond owners to repair, refit, or otherwise modify their ponds, or to evaluate their systems and to identify shortcomings that might explain recent water losses, reductions in flow, or a recent decline in water quality, and how those things might relate to the health of their fish, their plants, or themselves. In the former case, that of water loss, setting aside the unnecessary use of water, the safety issues include wet ground and the danger of slipping, and loosening rocks, with the inherent threat of them moving underfoot, or worse, the collapse of ill-founded waterfalls or pond sides. In the latter cases, the safety issues include disease or infection of themselves or their fish. In either case, it frequently becomes evident that if the pond builder had just thought some simple thing through a little more, or had asked the right questions before he finished the pond, the problem at hand would not exist. I will not address the ecological safety issues here, but will, instead, focus on the more physical dangers that exist around ponds. On those occasions when I speak to clubs, or I am called upon to look at a site and to educate a prospective pond owner about the pitfalls of pond construction and ways to avoid them, the conversation inevitably comes around to those safety issues that might cause drowning. Bridge railings are discussed, as are access areas, and electrical connections. By far, though, the most important consideration is how safe it is to approach and to work in the pond. This inevitably leads to a discussion about how ponds are constructed, and the means of attachment used for the stones at the margins of ponds. There has been a trend in the industry for the past several years for ponds to be built using flexible liners and pre-formed equipment, such as skimmers and filter tanks that double as waterfalls, etc. The ponds are built according to a formula set out by the manufacturers of the equipment. The method involves the use of rocks throughout the pond, with larger stones being used against the pond sides, and gravel being used on the horizontal surfaces of the pond, such as the planting shelves, and with the marginal stones being held in by gravity alone, or with sticky black foam. The theory behind this says that bacteria will grow on the stones and will be available to consume debris, and that the plants will establish themselves in the gravel over time. This is the subject of another article, frankly, so I will not delve into it here. With these "kits" available to build ponds with, everybody with a shovel has hired himself out as a pond builder, and many of these people do not really think about what they are doing. It is always easy to tell if a pond has been built by a thinking individual, or by one who has never thought to deviate from the formula in any way. Many builders will not touch such materials, and insist on working in concrete or not at all. There are advantages to both styles, and this is not meant to take anything away from the idea of the so-called "kit pond". Their skimmers are revolutionary in how they collect and hold floating debris, and many of their other innovations have expanded the design possibilities for water gardeners. The fact that they have made pond ownership so easy for so many people is something that they can be proud of, and for which the growers of pond plants and suppliers of pond equipment should be forever grateful. Nevertheless, there are at least three areas in which there is room for improvement, vis á vis safety, and they all involve rocks. A couple of them have become pet peeves of mine as I see the same mistakes repeated time and time again. First, the rocks on the bottom of a pond make it very difficult to walk around in the pond to do regular maintenance chores. Never mind the effect that all of those rocks have on the maintenance of the pond from an ecological standpoint, it is the danger of twisted ankles, jammed toes, possible liner punctures, and the simple danger of tripping and winding up being very wet, or worse, that cause people the greatest grief. My preference would be to have the rocks gone from the bottom of the pond entirely. This would allow the pond keeper to walk in the pond without the dangers listed above. Also, not having all of those rocks in the pond makes it easier to keep up with accumulated debris. Second, there is the matter of the way in which stones are attached, or not, at the margin of the pond. The most common practice is to stack rocks up against the sides of the pond from the bottom to the top, with each one being entirely dependent upon those below for its support. Moving one stone near the bottom of the stack will cause those above to settle or to tumble down into the pond, sometimes to the point that it is necessary to spend time restacking the stones each time maintenance is done. If the stones are attached with anything, the common means of attachment, as mentioned above, is the use of sticky, black foam, which can only work for so long, and which is used conservatively in most cases. I think that it is great for short-term displays, and I might have killed for some of it occasionally when I used to set up displays at our county fairs, but for a permanent solution to affixing stones to pond margins, nothing beats concrete and mortar. Using mortar to hold edging stones obviates the need for stacking stones up the sides of the pond to support the stones above, leaving more volume for fish and plants. By not mortaring the rocks together, the builder is setting the pond owner up for an accident. In my area, it is not uncommon for pond builders to use fist to head-sized, with the odd, accenting torso-sized, rounded river rocks, which lack sufficient angularity to lock themselves together in any meaningful way. The result of this is the tendency of the stones to roll underfoot. This is extremely unsafe and I have heard many complaints about it. When I learned how to build ponds, the liner manufacturer recommended a so-called, "key way", which was a trench dug entirely around the pond, lined with the top edge of the pond liner, filled with concrete, and set with stones or finishing concrete to complete the scene. The key way held the liner in place for evermore, unlike the casually laid liners of today, which can move. In some cases, where the top of the liner is too close to the water line, stepping on a stone in wet weather can easily push the stone and liner down sufficiently to cause an overflow. Thirdly, I do not know how many times I have heard a builder of ponds say to me, "Don't step on the waterfall rocks, they're only foamed in." Placing flagstone onto a weir is a great idea because of its flatness, but using foam to attach it is asking for trouble. Just recently, a new assistant of mine unwittingly stepped on to the weir in a stream that we were cleaning and broke it loose from its foam base. We had to fix it so that the pond owner would not lose water flow over the stone to leakage under it. My helper got a skinned shin when the stone popped up and smacked him in the lower leg, then fell edgewise onto the top of his bare foot, cutting him. By simply mortaring these stones down, all of these issues might be avoided. It might be nice, and a guy might feel pretty proud to build a "pond in a day", but a safe and well designed pond should take considerably longer. If the pond is going to be a permanent and major feature in a person's yard, then there is no reason not to do the simple things that make it a welcoming attraction, instead of a potential booby trap. Of course, one cannot discuss the safety of any body of water unless it is fenced in, or is otherwise protected against the possibility of a small child having unsupervised access to the pond. All it takes is one drowned neighborhood kid in your pond to completely ruin your day. In many communities, a body of water greater than 18" deep is considered an "attractive nuisance", and having one requires a fence with a locking gate around it. Leaving the gate open is an invitation to disaster in our litigious society. The two most popular means of isolation are the use of fences and nets that stretch across or around the pond. I prefer the vertical, nearly free standing fences that are manufactured for pool sides. I took care of a pond some time ago over which the owners had stretched a net with approximately 4" holes, attaching it to the stone deck and surrounding boulders with special hooks. It was fine except that you could not work in the pond without removing the net, which was a time consuming process, or by getting in under the net, and walking bent at the waist with your face next to the water. Both methods were inconvenient, and one day it occurred to me that the worst part of falling into water is the actual fall, and it was very easy to imagine their offspring slamming their heads into the rocks on the way down to the net, which was not rigid enough to keep the fallen person out of the water. Vertical fences provide both a visual and an actual barrier, which keep the child from falling over the edge in the first place. Of course, good training can go a long way toward safeguarding most children, and they, like any of us, need to know how to behave around water, but for the infant or toddler, a fence is a must. When the child grows to an age of greater responsibility, the fence can be removed easily. A related matter is the hazard represented by bridges. A bridge needs to be ample enough to support people, and it should have a railing of some sort to prevent falling. If the bridge is made of wood, it should be inspected from time to time to ensure that it is not rotting or that it hasn't been attacked by termites, or some other weakening agent. The undersides of bridges are a tempting place to hide wires, which can expose wires and their hangers and splices to moisture. This can eventually lead to trouble if it is not kept clean and dry. Even so-called outdoor junction boxes eventually corrode and become junk. Another aspect of pond safety has to do with the means of ingress to, and egress from, the pond. Too many times, we have encountered ponds in which there was no good or easy way to get in to or out of the pond. When the stones around the pond margin are loose, it is sometimes difficult for all but the most agile to get into the pond. A fixed location would be best for all involved. Even concrete ponds can sometimes be slippery with algae, so consideration should be given to provide a convenient point of access. I have seen others, and have caught myself, trying to get into the pond over the skimmer lid. This is a bad idea because sometimes they are not strong enough to support the weight of an adult. Of course, there are ways to avoid getting into the pond altogether, but I believe that a pond cannot be properly maintained without periodic walk-throughs, whose purpose is to remove decaying vegetation, remove loose detritus, and to keep more vigorous plants from overwhelming the other plants in the pond. Using pole nets and brushes is OK for getting at some things, but they are not as good as the hand in separating good plants from bad. In rock-lined ponds, I use the walk-throughs as opportunities to stir things up on the bottom a little, passing detritus through my net toward the skimmer. This is when ankles can be turned between stones, and toes stubbed on them. A further area of concern has to do with electrical service. I once worked on a pond that had been wired with Romex buried in the ground for about 75 feet from the pond to the house, which was old enough to still have fuses. This was a disaster waiting to happen. Even in professionally installed systems, the thing that causes the greatest wear and tear on electrical equipment around water is rust and corrosion. If there is a timer, especially one in a metallic box out in the weather, you should know that, eventually, the box is going to need to be replaced. Sloppy or poorly maintained electrical equipment is a hazard that should never be disregarded, and only qualified individuals should be allowed to install electrical service and equipment. Too often, people disregard safety considerations on the theory that accidents happen to other people, and that those who get caught by the consequences of sloppy installations are fools, while those who do not are clever and gutsy. I have taken more chances on my own installations at home than I have on any of my clients' projects for some reason, but this is just me, and I occasionally get caught by them, and I swear not to take that shortcut again. When it comes to my clients, however, and the unavoidable issue of liability comes to mind, I am very strict about how things go together. I never want to get a phone call telling me that a client broke a leg on rocks set by me, or that they got shocked when they turned the pump on or off. Safety is a top priority with me, as it should be for any builder of, owner of, or visitor to, a water garden.